A beautiful lanyard by Limeloot. Take it cruising with you and it will not disappoint. A must have when packing your cruise ship accessories, don't over pay for inferior lanyards on the ship. 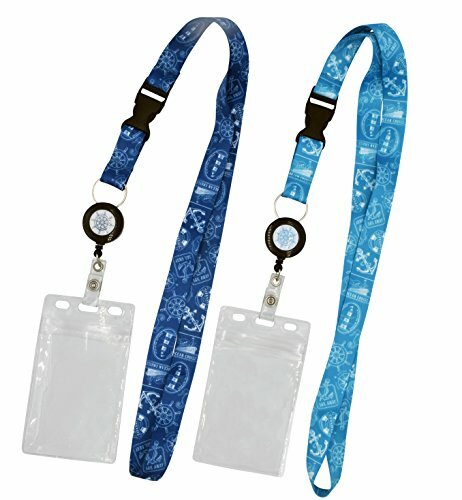 Nautical theme cruise lanyard featuring anchors, ship, lighthouse and more. 2 colors included, White on Teal and Teal on Navy. Designed by Limeloot. Comfortable 22" length with silky smooth polyester and release buckle for even more versatility. Detachable and Retractable badge reel with water resistant badge or cruise id holder. Easily show and protect your cruise id card, a true cruise essential. Compatible with id cards from any ship, Carnival Cruise, Royal Caribbean, NCL, and others. If you have any questions about this product by Limeloot, contact us by completing and submitting the form below. If you are looking for a specif part number, please include it with your message.